Place shrimp in a shallow pan and cover with juice from the lemon and lime reserving the zest refrigerated for at least 3 hours or until shrimp is firm and white. Mix remaining ingredients in separate bowl and allow marinating while shrimp is cold cooking. After time has lapsed and shrimp is cooked, mix the shrimp with liquid in with the remainder of ingredients. 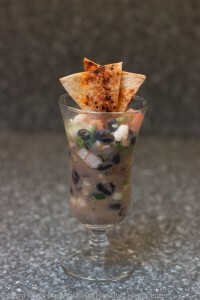 Serve well chilled with baked tortilla chips. Technique: Try this cold cooking technique. Taste: The combination of fresh vegetables and herbs is great. Try: Add a little more citrus for extra heat relief. Tip: Beans are a good source of protein, fiber and iron.